I’m so excited to share my first bump date for this pregnancy! I loved sharing them with you guys when I was pregnant with Noah. 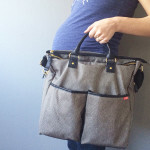 They are such a fun way for me to reflect on my pregnancy, and also connect with other expecting mamas! By the way, thank you SO much for all of your sweet responses when I announced my pregnancy, you guys are the best! I will most likely change up the questions each time I do these, so the content is new each time. 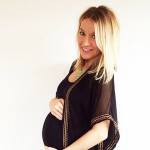 Hopefully I can share them here on the blog often, because I love sharing everything pregnancy related with you guys! Name: This has been a hard one for us. For some reason it was so much easier to come up with boy names. We are nowhere near making a decision, and probably won’t announce the name until she’s born. Cravings: This pregnancy has been different than my last when it comes to cravings. I’m craving salty & sour this pregnancy, wheres with Noah I craved sweets. I’ve also been loving fruit, specifically strawberries. I also find myself cooking up the occasional 3 pm spaghetti. There’s just something about pasta & pregnancy that go so well together. How I’m Feeling: I actually had a bit of a scare early last week. I wasn’t feeling very well over the weekend, and then on Monday I lost some of my mucus plug. You don’t usually lose your mucus plug until you are about to go into labor, so I was freaking out. I rushed into my doctor’s office, and they checked me to make sure my cervix wasn’t opening, and that I wasn’t dilating at all. Luckily neither of those things were happening, so they wanted me to see a specialist the next day to get an ultrasound to measure the length of my cervix. Basically they told me if my cervix was shortening this means possible preterm labor, and a possible surgery to stitch up the cervix. Long story short, I could not sleep on Monday night. I was freaking out, and hoping everything would be okay with me and baby. The next day I went to see the specialist, and they said everything looked great. They said my cervix is long, I still have some of my mucus plug (supposedly parts of it can randomly come out, but it regenerates), and that baby was looking great. Talk about a giant sigh of relief, and a lot of worry for nothing. Phew. I am so glad I went into the doctor though, because I need to have peace of mind when something doesn’t seem right. Other than the scare, I’ve been feeling pretty good. I feel like I’ve finally gotten most of my energy back (first trimester I was SO tired). I’m feeling a bit of cramping/pulling already which are just signs of things stretching out, and is totally normal. I try to get as much sleep as possible at night, because I know once the baby comes I won’t be getting much for awhile. 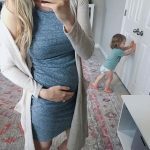 Pregnancy Purchases So Far: I shared my first trimester must-haves post with you guys last week, and I shared everything that I purchased, and used during my first trimester there. I just ordered this pair of maternity jeans from ASOS over the weekend, and I can’t wait to get them in. They were only $46, and they are super cute so I’m excited to get them! Movement: I felt her kick for the first time last week. I felt it so much earlier this time than I did with Noah, and I was so excited. I love to lay still on the couch at night, and wait for her kicks. Daddy is: Excited for a little girl too. He really wanted a girl so we had one of each, and I can’t wait to see how sweet he will be with a daughter. He isn’t the best with coming up with names though, haha! Thanks so much for reading today babes. I’m excited to keep you in the loop during this exciting time! « My Cozy Cardigan & A Gucci Giveaway! So random…is the bed the light gray or the dark? I have searched this bed EVERYWHERE for the light but Hayneedle and other sites only have the dark available. Help! Congrats on being 16 weeks! What an exciting time for you and your hubby! Little miracle! Congratualations on the baby! I too have a boy first and then a little girl came along shortly thereafter. It was definitely an adjustment with the little girl. She is fiesty, opinionated, and very different from her calm brother. But I truly enjoy having one of each. No more for us though…the perfect pair is good enough! You look adorable! So so exciting! You look so amazing! You should have seen what I looked like at 16 weeks! You look so cute in that dress! Glad to hear everything is progressing as it’s supposed to, and that you are getting your energy back! Gorgeous!! Loving reading about your pregnancy!! And, I agree.. girl names are a little harder. You look amazing! Love this dress on you! You look amazing girl! I’m so glad that everything turned out to be okay! I am happy to hear you are ok. There’s always a lot of worry as a new mom!! Such a cute post!! And so scary. Glad everything is okay! Congrats! Congratulations on your pregnancy! I am glad everything is okay with you and the baby. I hope you have a healthy and easy time for the rest of it! little girls are the best! you look amazing mama! I hope the rest of your pregnancy is smooth! You are the cutest! Can’t wait to see what you guys decide on for a name.